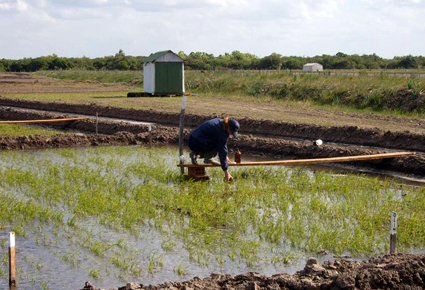 Researcher Guillermina Cantou collects water samples for analysis from an experimental rice paddy in Treinta y Tres, Uruguay. UC DAVIS (US)—A simple water test is helping farmers in Uruguay know if rice fields are safe to drain, and will be instrumental in efforts to stop pollution of the country’s water sources and a globally valuable nature preserve. The test checks for levels of the herbicide clomazone, used on 78 percent of Uruguay’s rice fields. When applied in high doses, clomazone can cause liver disease in experimental animals. It also is known to disrupt fish hormones, affecting their ability to reproduce. Clomazone, however, usually degrades to safe levels during the rice-growing season. Holding water on the fields for just the right amount of time can make the water safe for streams and rivers, without damaging the farmer’s harvest. The new test technology developed by researchers at the University of California, Davis, gives scientists a way to determine whether the degradation process is complete. Eventually, it should be available to farmers in a simple “dipstick” field test. The farmer would take a few ounces of water from the rice paddy, dip in the test stick, and wait a few minutes for results. If the stick color turns one color, the water is safe to release. If it turns a different color, the farmer should wait a few days and test again. Developing best rice-farming practices to avoid release of toxic chemicals to the environment is especially urgent in Uruguay, because water drained from the country’s main area of rice cultivation flows into the marshlands of the Eastern Biosphere Reserve (Reserva de Biosfera Humedales del Este). This reserve is managed as part of the United Nations’ UNESCO Man and Biosphere Reserve Program, which promotes environmentally sustainable human development and is also the headwaters of streams and rivers that provide water to hundreds of thousands of people and millions of birds. Details of the study are published in the online edition of the Journal of Agricultural and Food Chemistry.